Norton Power Eraser is a handy tool that is readily available anytime to get rid of computer malware. This virus removal program was made for Windows users and was designed using the same scanning engine that powers most of Norton and Symantec anti-virus products. It doesn’t matter if you are a tech person or not. You will have no difficulty using Norton Power Eraser because it was built to be user-friendly with an easy-to-understand graphical user interface. On the first time that you will be using this tool, only one button is needed and scanning for viruses pretty much accessible right at the main window. The only difficult decision you have to make is whether you will allow Norton Power Eraser to scan for rootkit, and that requires for a computer reboot. As always, we highly recommend rootkit scanning using this tool. This product is intelligent to detect and remove threats. It also executes firm decision whether it will delete or quarantine suspicious files. If something went wrong, Norton Power Eraser can undo previous fix so there is nothing to worry if ever precious files were deemed malicious and were accidentally removed. For advanced users, the program has and advanced settings wherein you can do specific scans to consume less of your time. Use Norton Power Eraser to find and fix security risks on your computer. How to Download, Install, and Scan with Norton Power Eraser? 3. You will be prompt with End User License Agreement. Please click on Accept to continue. 4. Norton Power Eraser will check for the most recent version. Then, the main window will appear. Click on Scan for Risks to begin. 5. 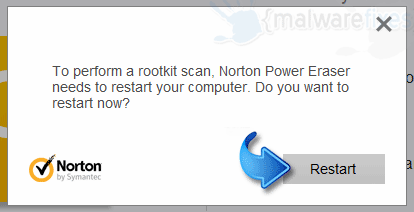 By default, Norton Power Eraser was configured to perform a rootkit scan. To accomplish this, you will need to restart the computer. Please click Restart button. 7. 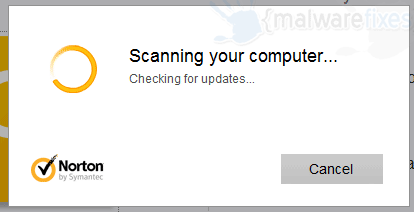 Once scanning is done, Norton Power Eraser will display a list of threats. Review identified threats and remove/repair them from the PC by clicking on Fix Now button .